Sustainable transport is the key to promoting rural tourism and supporting the predicted growth in the visitor numbers to Northern Ireland, according to University of Ulster research. However a study carried out by the Ulster Business School has revealed that the vast majority of visitors to the Giant’s Causeway - one of Northern Ireland’s most iconic and ‘must see’ attractions – travelled by private car. Sustainable Transport for Rural Tourism will be the theme of a conference in Derry~Londonderry this week hosted by the University’s Ulster Business School. Keynote speakers at the conference will include transport providers from the public and private sectors and tourism promoters will exchange ideas on good practice. The conference is linked to Transtourism, a transnational European research project which Ulster Business School staff including Mr Derek Bond, Dr Elaine Ramsey, Dr Norry McBride and Mr Andrew Kincaid (Project Research Assistant) are involved in. Derek Bond said he hopes the conference will be an opportunity for key stakeholders to share best practice from around the world which could help influence future transport policy in Northern Ireland. Dr Norry McBride said the NITB figures show that the tourism industry in Northern Ireland is predicted to experience strong growth. According to Dr Elaine Ramsey, the recent survey conducted by the Ulster Business School team of visitors to the Giant’s Causeway has revealed a perception that the public transport system in Northern Ireland is lagging behind other countries, with only 25% believing it to be better in comparison. “The study highlights that 83% of tourists to the Giant’s Causeway used private cars to get to the destination, mainly due to convenience, and only 4% used public transport. Speakers at the conference will include Stephen Finlay (Corporate Development Director of the Northern Ireland Tourist Board) who will focus on NITB’s research into valuing the tourist and how changes to transport could help Northern Ireland achieve its potential as a tourist destination; Tom Reid (Director of Transport Policy, Strategy and Legislation at the Department for Regional Development); Teresa Lennon (Programme Manager, Special EU Programmes Body); Stephen Finlay (Corporate Development Director, Northern Ireland Tourist Board); Gordon Clarke (Director for NI and ROI, Sustrans); Bernard Clarke (Research & Technical Support Manager, Translink) and Sharon O’Connor (Chief Executive and Town Clerk, Derry City Council), as well as a number of international research partners from the TransTourism project. 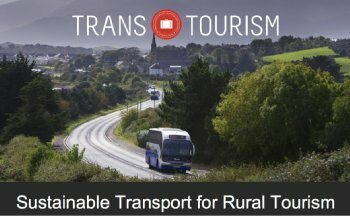 TransTourism is funded under the INTERREG IVB Northern Periphery Programme 2007-2013, and aims to help develop and implement sustainable solutions for transport services adapted to rural tourism areas in the Northern Periphery of Europe, including Sweden, Iceland, Scotland, Republic of Ireland and Northern Ireland. For more information, go to Andrew Kincaid at aj.kincaid@ulster.ac.uk or on (028) 70323922.